It's hard to imagine anything more gorgeous than that one bedroom suite with the private plunge pool on your own secluded balcony overlooking nothing but bright blue water for miles and miles. When you hear the words "Overwater Bungalow" or see breathtaking photos like the one above, many automatically think of places like Tahiti, the Maldives, and Fiji. When it comes time to planning honeymoons and romantic vacations, those destinations and their sweet suites, top many couple's bucket lists. But in reality, it takes a large amount of time and money to make those dreams of staying in a suite over-the-water come true. 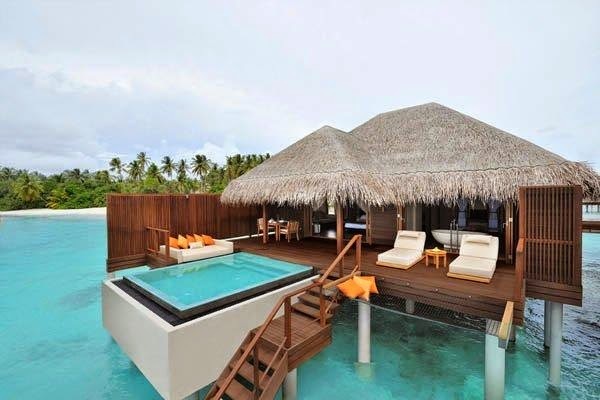 Imagine not only having your own bungalow over the water, but enjoying it on a private island too. 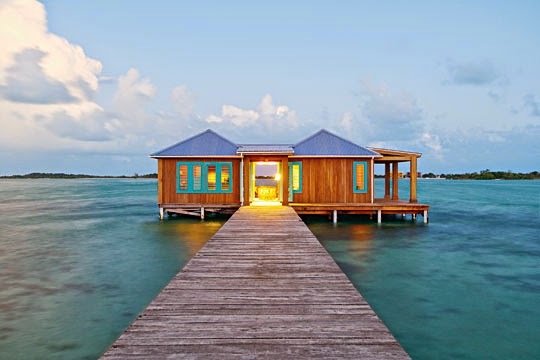 You can experience that at Cayo Esperanto in Belize. 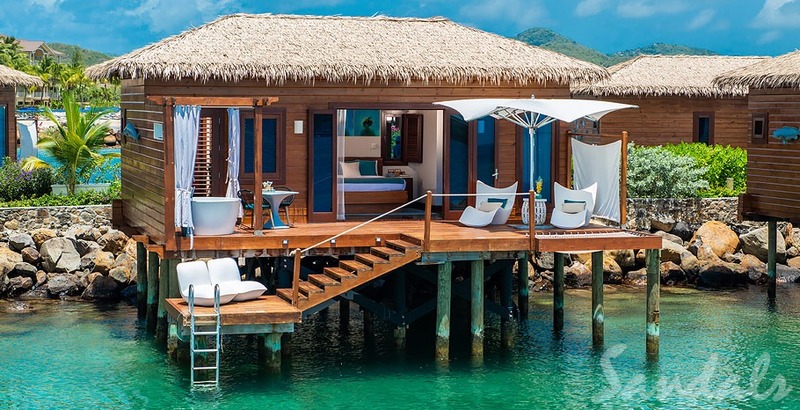 These overwater suites offer everything you need. Air conditioning, electricity, gorgeous views, marine life around you, and a hammock on your deck so you can enjoy your surroundings. 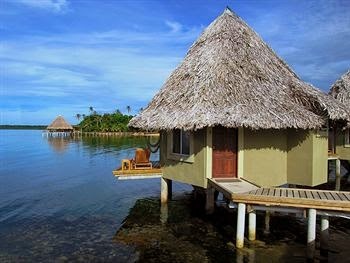 This is an excellent choice for couples or families that want the beauty of an overwater suite but also love adventure. Not only will you have gorgeous views from your bungalow, but you'll get to experience water sports, diving, snorkeling, horseback riding, swimming with marine life, and more. 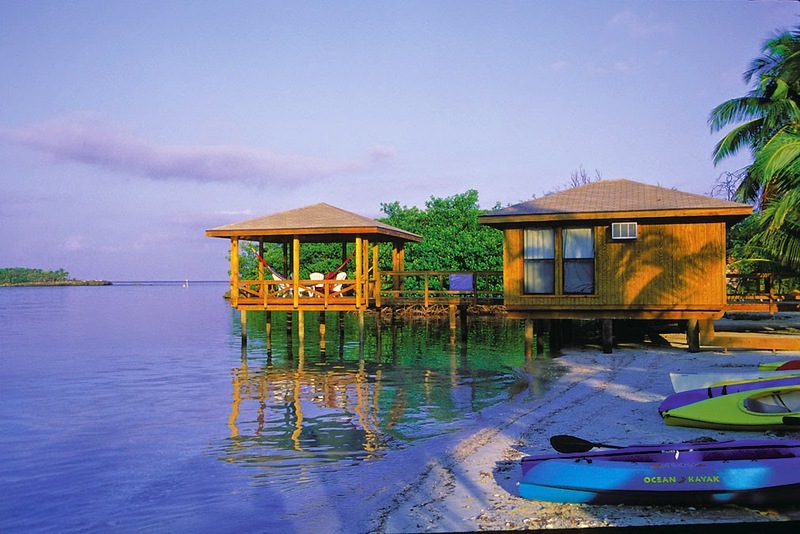 Anthony's Key Resort has it all! Another great choice for the adventure lovers. 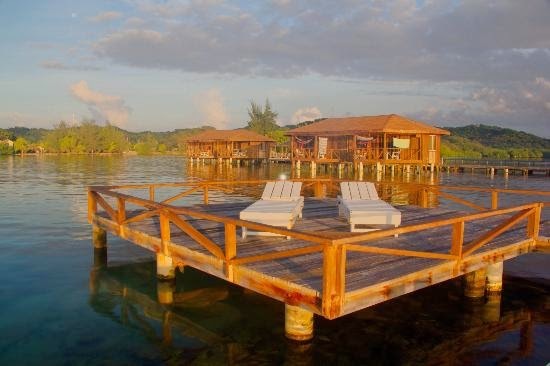 During the day you can enjoy diving, snorkeling, fishing, and even local eco tours. At night lay on the hammock on your deck and watch the clouds change colors with the sunset until the sky is full of stars. These bungalows actually sleep 4 (one queen bed and two twin beds) which makes it a great option for families looking to enjoy a bungalow together. Jumping from the deck into the ocean? Watching fish swim under your feet through the glass in the floor? Sounds like a kid's paradise! 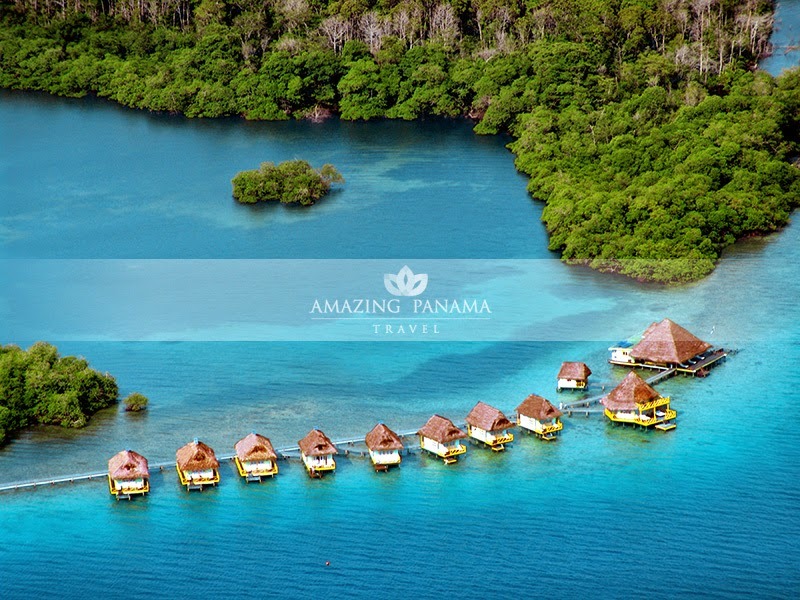 Want an authentic thatched roof hut over gorgeous blue water surrounded by lush green landscape? This is a perfect option located fairly close to home for those in the Western Hemisphere. Best part is, it's located among a mile long stretch of coral reef allowing guests to see plenty of marine life during their stay. 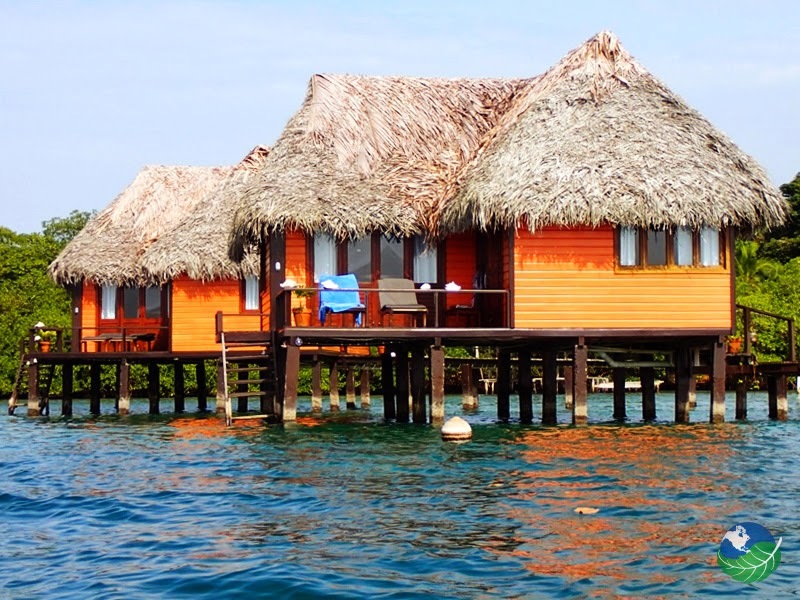 This secluded resort is located near San Blas Islands. It is surrounded by natural habitat making it an excellent destination for nature lovers. 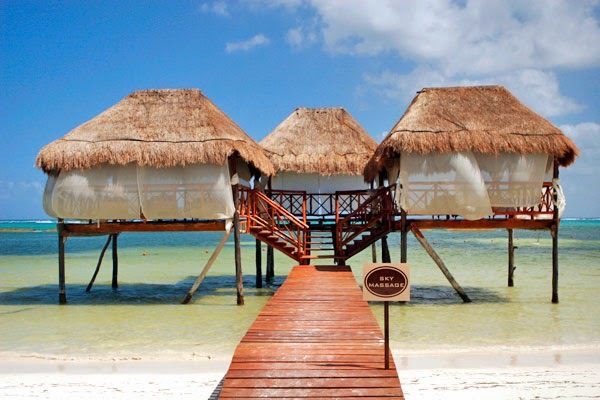 Plus, you can't beat the beautiful views from the hammocks on the sundecks of the seven overwater bungalows. 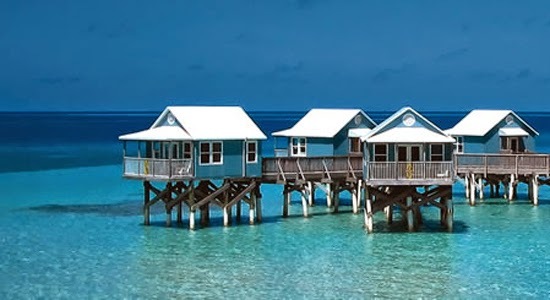 Gorgeous blue water surrounds what resembles small homes on stilts. This resort is where a beach house meets the ocean itself. This property is currently closed and undergoing a $55 million dollar renovation and we can't wait the finished results when they reopen in 2015. 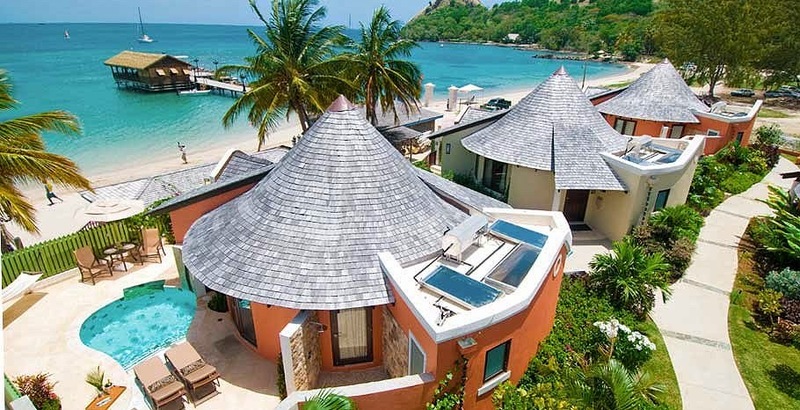 Enjoy a private overwater bungalow looking out over the emerald ocean in St. Lucia. 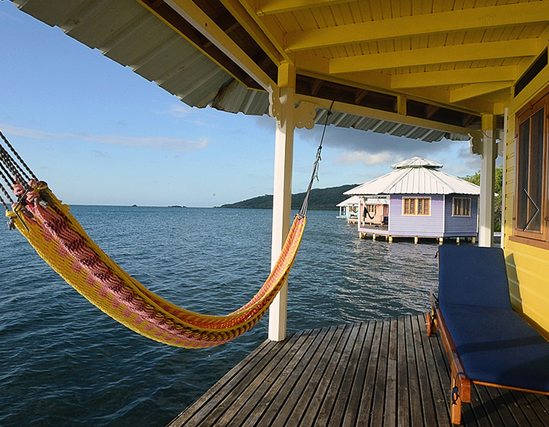 Dip into your soaking tub, or jump right off of your deck into the warm calm sea. 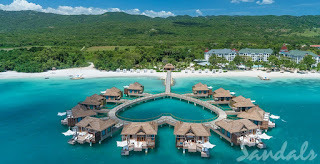 Shaped like a heart over the water in the southwestern coast of Jamaica, these secluded and luxurious suites overlook clear blue water at one of Jamaicas best resort locations. 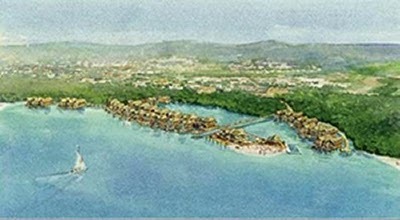 AM Resorts is bringing the first overwater bungalows to Aruba-- 126 of them to be exact. The property was expected to begin construction in 2015 but that has been put off. We're hoping they should be ready for guests by 2022. 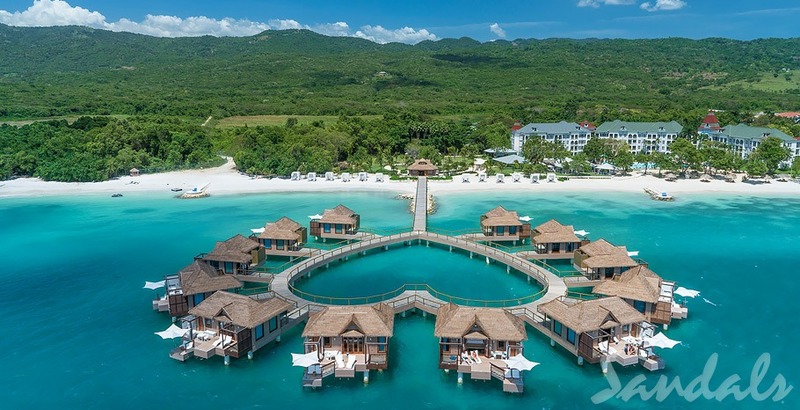 Royalton Antigua Resort & Spa is opening in May 2019, bringing the very first overwater bungalows to the island of Antigua. 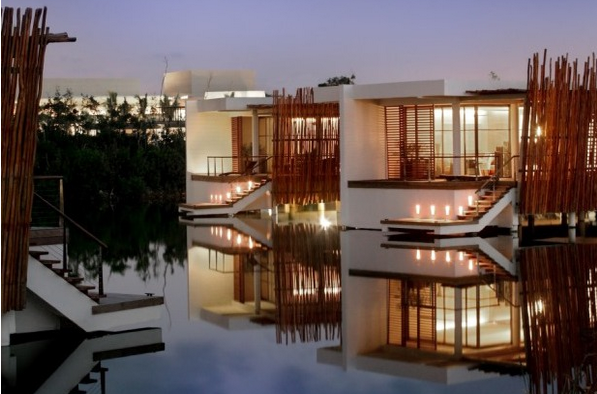 While these aren't technically overwater bungalows, this resort does offer pavilion suites with sundecks overtop of tranquil ponds. It's great for guests who want to stay on or near water. 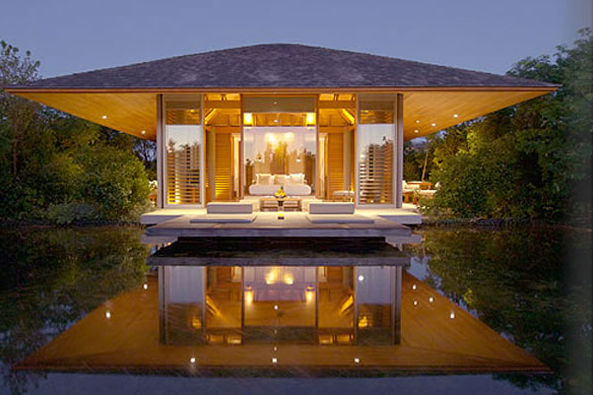 Like the resort in Turks & Caicos, this resort offers overwater suits floating above a quiet lagoon. It's a great option for guests who want to be near water and enjoy privacy away from the beaches. 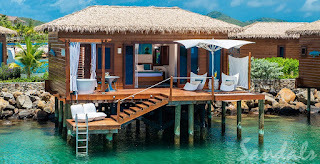 These "Rondoval Suites" as Sandals calls them, boast private plunge pools, an outdoor shower, and your own personal butler for the duration of your stay-- all within steps from the water's edge. This "Millionaire Suite" at Sandals La Toc offers stunning views of St. Lucia from the privacy of your sundeck's private pool and jacuzzi. The walls of the suite's livingroom and bedroom open up to allow for one large indoor/outdoor living area. 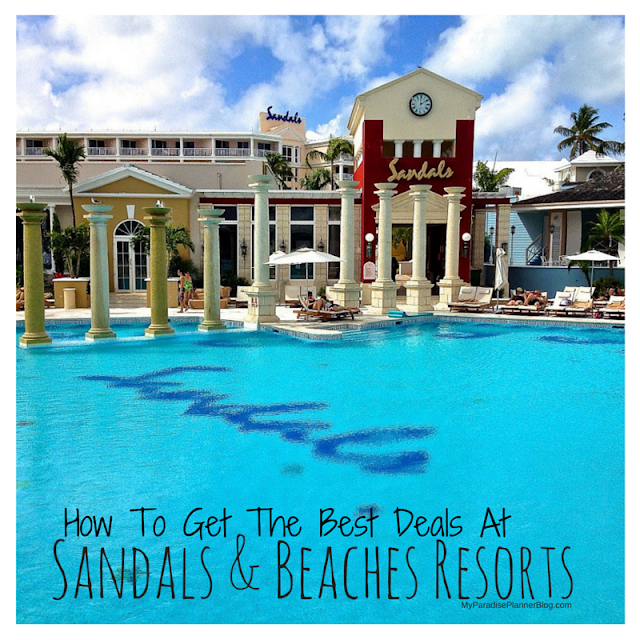 Swim-up suites are also popular at Sandals Resorts. 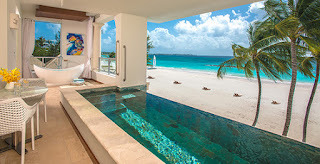 From this suite you can swim up to your patio or out to Seven Mile Beach in Negril-- made famous for it's beautiful calm and crystal clear water and it's gorgeous sunsets. Stunning "Skypool" suites are exactly as they sound. Overlooking the beach, you'll be able to relax in your own private plunge pool on your balcony. Or, prefer a ground floor? 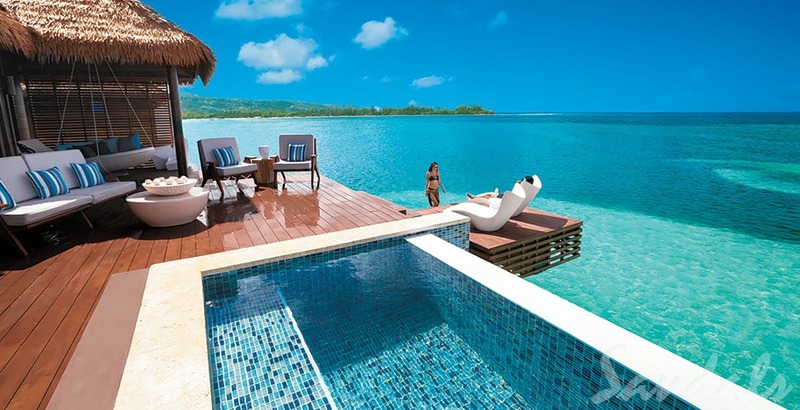 Enjoy a private pool that allows you to be steps from the sand. Want to be alerted when some of these suites are available? Click here to be added to our "First To Know" list.